The PolarKraft FRONTIER Line of Hand-Crafted Aluminum Boats has been one of the best values in the fishing boat industry for decades! FRONTIER’s wide beam design with one level deck and abundant storage make it the perfect fishing boat for the serious angler. 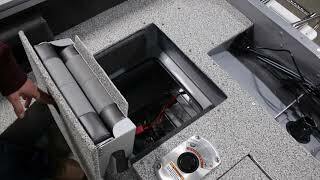 You’ll love FRONTIER’s huge live wells, forward bait well, lockable rod storage and numerous accessories that you can customize your boat with.